Site Specific Art” brilliantly charts the development of an experimental art form in an experimental way. Nick Kaye traces the fascinating historical antecedents of today’s installation and performance art, while also assembling a unique documentation of contemporary practice around the world. The book is divided into individual analyses of the themes of space, materials, site, and frames. These are interspersed by specially commissioned documentary artwork from some of the world’s foremost practitioners and artists working today. This interweaving of critique and creativity has never been achieved on this scale before. 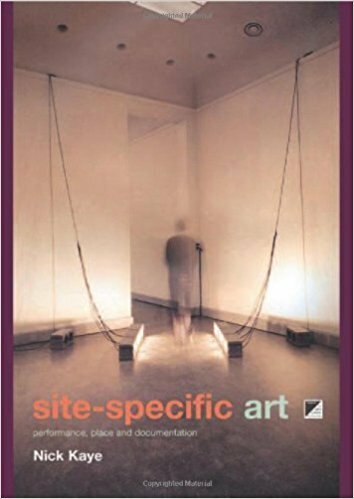 “Site Specific Art” investigates the relationship of architectural theory to an understanding of contemporary site related art and performance, and rigorously questions how such works can be documented. The artistic processes involved are demonstrated through entirely new primary articles from: * Meredith Monk * Station House Opera * Brith Gof * Forced Entertainment * Michelangelo Pistoletto . This volume is an astonishing contribution to debates around experimental cross-arts practice. Text: Kaye Nick. cm 17×24,5; pp. 224; COL and BW; paperback. Publisher: Routledge, Andover, 2000. Request info for "Site Specific Art. Performance, Place, and Documentation"